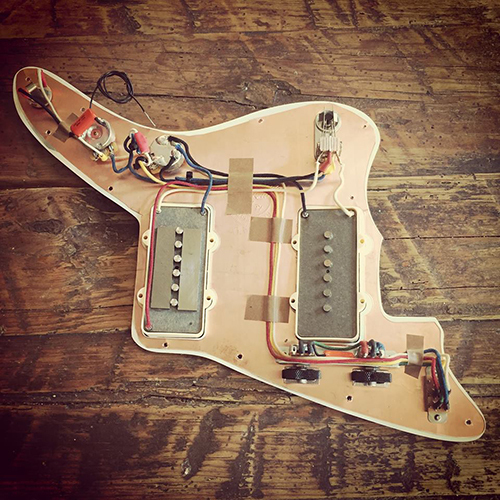 Use this page to order a prewired Jazzmaster assembly with vintage wiring. Select from the options below and then add the assembly to your basket. You will find information about each option is at the bottom of the page. The initial price of every prewired assembly is $0, but after you add it your basket the actual price will be calculated. You can view the total price by viewing your basket contents. Upon installation of one of our custom wired assemblies, you will notice an improvement in both clarity and character, coupled with more reliability. Not only is this is because we use only the finest components available, but also because we have been wiring Jazzmasters since 2002 and know how to make them soung great. Every component is hand picked for tolerance. Every pot treated with Caig D5. Every sensitive connection insulated with heat shrink. 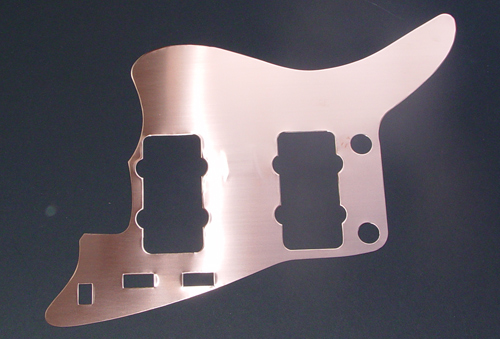 Every pickguard fitted with our signature copper shield. Every solder joint solid and shiny. Every assembly custom ordered, and never mass produced. Every unit tested extensively. All assemblies are custom built to your specs. This is an opportunity for you to select the options you want. You will notice, the base price of a prewired assembly is $0. You will then proceed to add attributes to customize your prewired assembly. Some of the attributes are mandatory, and some are optional. To determine the final price, simply add the product to your online shopping basket, and then click the "basket contents" link in the navigational header at the top of the page. Have no fear, you are not committed to purchasing it until you actually use the checkout feature. Pickguard -Various color choices are outlined below. In addition, you will be asked to specify the fit, either USA/AVRI, Made in Japan, or Fender Blacktop. Note 1- if you want us to special order another color, we can do so if you indicate such in the comments field. Volume Kit: a treble retention circuit will be added to the volume pot on the lead circuit, which will prevent the loss of highs experience when you lower your volume. Pickups: Select any model from Curtis Novak, Lindy Fralin, Arcane and McNelly Pickups. 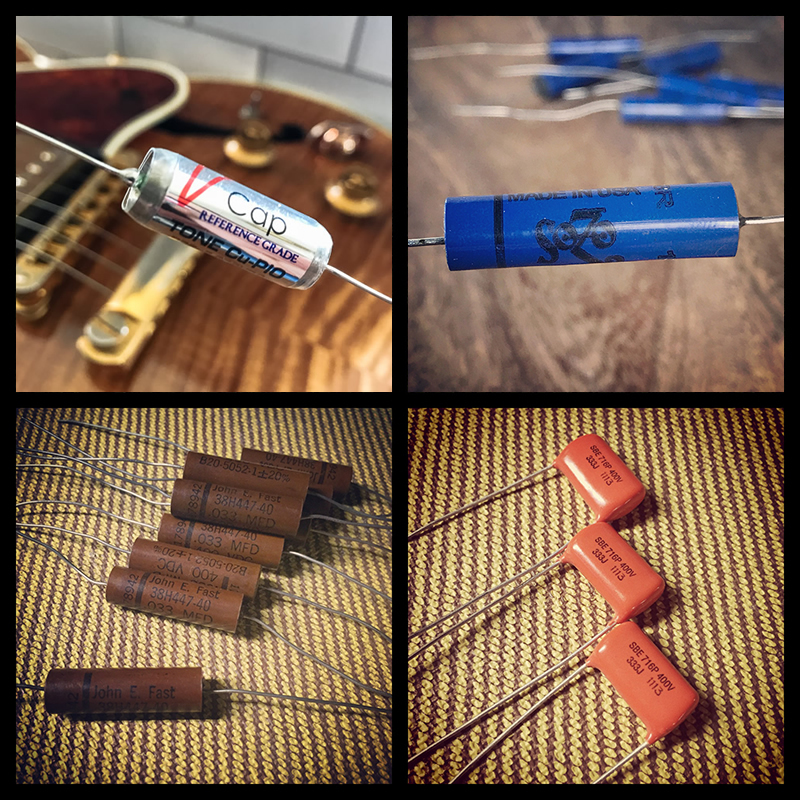 Tone Capacitor Upgrade for Lead Circuit: You may choose between Uptone Audio MusiCap, VH Audio V-CAP, and NOS John E. Fast PIO capacitors. We offer a variety of pickups to accompany our vintage reproduction Jazzmaster including from Curtis Novak, Lindy Fralin, McNelly and Arcane. We are an AUTHORIZED DEALER for all of the aforementioned companies, so the pickups come with the full warranty. You are welcome to mix and match any combination of pickups, however we recommend that you stick with one manufacturer for both the neck and bridge pickups to avoid potential phase issues. Novak Telecaster® Bridge pickup made for the Jazzmaster form factor. Novak Jazzmaster® / with Strat magnets and fatter wire. Has a really fat sound! An awesome combo is JM-FAT in the bridge with a JM-V in the neck. McNelly 46/58 Jazzmaster® Replacement Pickup - a very musical blend of traditional Jazzmaster design with that of a P90. The tone has the super chime of Jazzmasters, but with less compression and a much broader range. Lindy Fralin Jazzmaster® Replacement Pickup - choose between standard, Steel Poled, and hum-cancelling with Alnico magnets. A .033 MDF SBE Orange Drop capacitors will be used by default at no extra charge, or for an upcharge you may select between Sozo NextGen Blue Molded, NOS John E. Fast Paper in Oil, and VH Audio V-Cap TFTF Teflon Film and Foil capacitors. The price will vary depending upon which capacitor you select. Read about our capacitor choices here. The capacitor upgrade option applies to the lead circuit only. A .022 MFD Orange Drop capacitor will be used in the rhythm circuit. A volume kit (also know as a treble bleed mod or treble retention circuit). This is a high-pass filter used to prevent the loss of highs associated with lowering the volume on your guitar. We use a 1000 pf Mallory 150 Series Metalized Polyester Tubular capacitor in parallel with a 150K resistor. Check out our article about the Treble Bleed mod here. We get the majority of pickguard from WD Music Products. We have the most common colors listed in the ordering form, but you may choose from any of the many colors available and list it in the comments field. USA / AVRI - Available with both WD Music and Tone-Guard pickguards. Fender Blacktop - Available with both WD Music and Tone-Guard pickguards. See picture below of a Fender Black-top pickguard shape. 2007-2010 Made in Japan. Available with WD Music ONLY - Tone Guard anodized pickguards are NOT an option for these. What about Mexican Made and Squier Vintage Modified Jazzmasters? If you have a Fender Road Worn series, the USA / AVRI is extremely close, so that will be your best best. If you have a Fender Blacktop series, then please specify that as the shape when placing your order. That will require a special pickguard which is available both from WD Music and Tone-Guard. If you have a Fender Classic Player series, then select "special order" for the pickguard and indicate the details and color choice in the comments field. The Classic Player will aslo require a special pickguard, which is available from WD Music ONLY. Tone-Guard is NOT yet an option for the Classic Player series. If you have a Squier Vintage Modified Jazzmaster, the shape is fairly close to the USA/AVRI shape, so that will be your best bet. Some of the pickguard holes won't line up exactly, but that is easy to manage. Warmoth has their own unique shape, but no worries we work with Warmoth JM's all the time. If you are building a warmoth Jazzmaster and would like to get a prewired assembly from us, you then have 2 choices. 1). You can mail us your pickguard. 2). You can select "Special order" as the pickguard choice, and then clearly document all of the specs of the pickguard and we will special order it for you. Tortoise pickguards are made of real celluloid like you will see on vintage Fender guitars. This is the GENUINE stuff. Please be aware that celluloid is very flammable, so please keep it away from flames. Celluloid is a solvent based plastic and it tends to shrink over the years. Many vintage Fender guitars are plagued with this phenomenon. Very often the material cups slightly, so that when placed on a flat surface its edges may be raised 1/4" to 1/2" above the surface. Even if they're cupped when they come out of the package, they can easily be screwed flat onto the guitar. We are the only company offering pre-wired harnesses with very high quality, noise canceling, THICK copper shielding. NOTE: If selecting the wooden template option, you will need to install the shield to your pickguard. Please refer to this youtube video for instruction on how to install the shield. You may read more about our shields here. Available in white, black, cream and parchment. 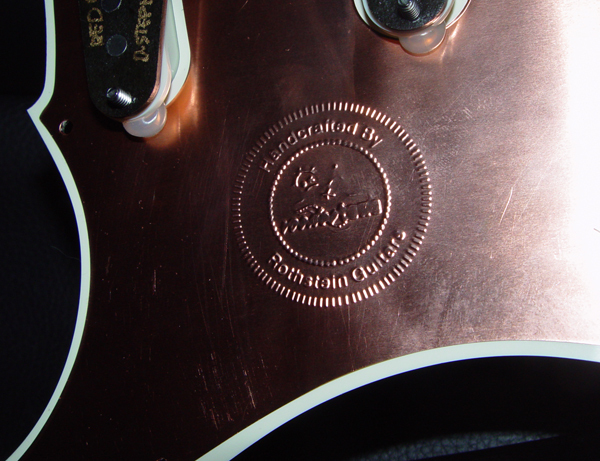 The copper shield will be embossed with our logo as a method of branding and authenticating our wiring. Each prewired assembly is hand wired and tested to your custom specifications. Our lead time on Jazzmaster assemblies is approximately 3 - 4 weeks. We will do our best to process your order as quickly as possible.